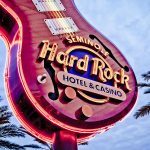 As you may know, the Seminole Hard Rock Hotel & Casino Tampa is honoring rock legend, Elvis Presley with a week-long celebration featuring tribute concerts, slot tournaments and even Elvis themed cuisine. The pop-up Elvis menu will be in the Hard Rock Cafe for you to try from January 5-11. Kick off your new year the right way and put on your blue suede shoes to eat like the “King of Rock and Roll” in the Hard Rock Cafe.